The day I've been waiting for has finally come. Yesterday, I did my usual shopping at Whole Foods, and as I strolled past the artichokes, I did a double take. They were big and beautiful! Normally, when I see artichokes I pass them up because they usually are too small, and just don't look good. I couldn't resist and I grabbed the 2 largest. 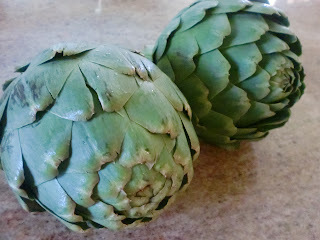 Artichokes are the ultimate treat for me, I would take them anyday over dessert. We just finished our dinner, and I'm feeling a little sick now because I ate an entire artichoke myself. It was so worth it. 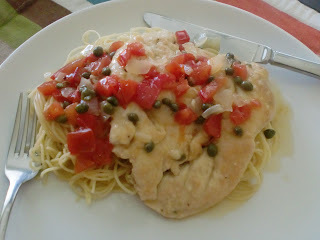 I also made Chicken with Capers and Tomatoes over Angel Hair Pasta, and Hoffbrau Salad. This is a garlicky chicken piccata with tomatoes, if you don't like so much garlic, you can definitely use less. I found this recipe online, it was adapted from a restaurant in Boston called Sweet Basil. Place the chicken breasts, two at a time, between 2 large sheets of plastic wrap. Use the smooth side of a meat mallet to pound them to about 1/2-inch thickness. Sprinkle the chicken with salt and pepper. Spread the flour on a plate and dip the chicken into it to coat both sides, shaking off the excess. Add the garlic to the pan and cook, stirring, for 30 seconds. Add the wine and lemon juice. Simmer, scraping up the browned bits on the bottom of the pan, for a few minutes or until almost all the liquid is gone. Add the stock, tomatoes, and capers to the pan. Turn the heat to high, and bring the liquid to a boil. Simmer steadily for 6 minutes or until the liquid is reduced by about a third. Stir in the remaining 2 tablespoons of margarine. Return the chicken to the pan and simmer for 2 minutes or until the sauce thickens slightly and the chicken is cooked through. Taste for seasoning and add more salt and pepper, if you like. Sprinkle with parsley. Serve over angel hair pasta. Mix together the olives, juice, garlic, lemon, vegetable oil, salt, and pepper. Place the lettuce in a salad bowl, and pour the olive dressing over. Add the tomatoes, and toss to coat. *Note: The original recipe (the way my Grandfather made it), calls for you to use a wooden salad bowl (which I don't have). You rub the inside of the bowl with a cut clove of garlic, this is instead of minced garlic. Then mix together the olives, juice, lemon, oil, salt, and pepper. Add the lettuce and the tomatoes and toss to coat. This recipe is good served crisp or soggy. I like to dip cooked artichokes in melted margarine or yellow mustard. My mom would make one artichoke for 6 people when I was growing up, I was definitely deprived. 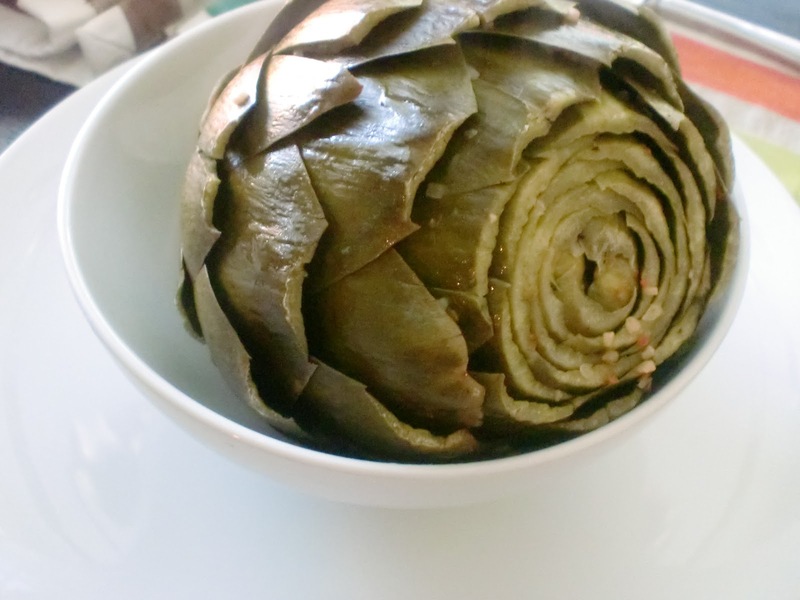 I never realized this deprivation until when I was 12, I had dinner at a friend's house and they served 1 artichoke per person, I was forever ruined. Cut the stem and the top portion off of the artichoke, and trim sharp edges with scissors. In a large pot, fill halfway with water. Place the artichokes in the water (they don't need to be covered in water). Squirt half a bottle of Wish Bone Italian dressing over the tops of the artichokes. Cover the pot, and turn the heat on the stove to high. Bring to a boil, and then lower to a simmer. Cook for 45 minutes-1.5 hours depending on the size of the artichokes. Artichokes are ready when you can pull a leaf out easily. 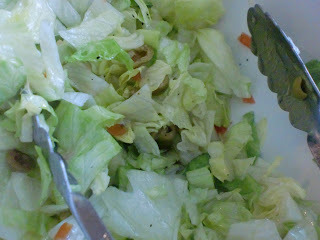 Once you have eaten all of the leaves, use a fork and scrape out the hairs. Discard the hairs. You will be left with the best part, the heart! Enjoy!